In 2011, Amanda Beal and several others, including Russell Libby (then MOFGA’s executive director), began to explore deeply the capacity for New England to produce much more of its food than it currently does. They developed “A New England Food Vision: Healthy Food for All, Sustainable Farming and Fishing, Thriving Communities,” published by Food Solutions New England. That vision was the topic of Beal’s keynote speech at MOFGA’s 2016 Common Ground Country Fair (posted at https://www.youtube.com/watch?v=1dktL4gcu2o). 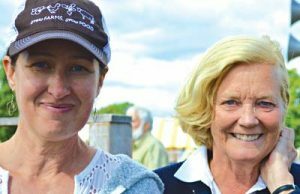 Beal grew up on her family’s Maine dairy farm and on Casco Bay, where she has fond memories of digging clams for dinner in summer alongside her grandfather and warming the bench of his smelt shanty in winter. Beal is a MOFGA board member and past president. 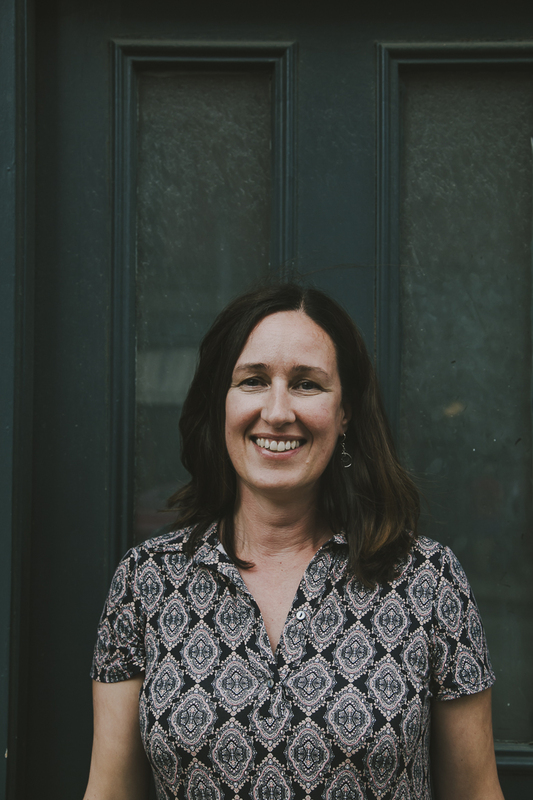 She holds a master’s degree from the Tufts Friedman School of Nutrition Science and Policy, is completing her Ph.D. in the Natural Resources and Earth Systems Science program at the University of New Hampshire, and was recently appointed president and CEO of Maine Farmland Trust. This vision began in 2009, said Beal, with conversations among the New England delegates to the Spannocchia Foundation (an 1,100-acre organic education center in rural Tuscany), including Russell Libby, John Piotti (then President and CEO of Maine Farmland Trust), Maine chef Sam Hayward, and agricultural historian Brian Donahue of Brandeis University. This trip also catalyzed Libby’s development of the “Maine Local 20”: 20 foods that Maine can produce for its citizens to enjoy all year, including dairy, potatoes, carrots, meats, seafood, apples, eggs, dry beans, greens and more. In 2011 Food Solutions New England held its first New England Food Summit, where Donahue said he had started looking at data and considering what we could produce in New England. Libby and Beal were interested enough to join in that work. Currently about 90 percent of New England’s food is brought from outside the region by a global system that produces abundant food but does so in ways that too often undermine the planet’s soils, waters and climate, said Beal. Feeding New England’s 14.5 million people takes about 16 million acres of land, the way we eat now. This represents more than 1 acre per person per year. New England now produces food on about 5 percent of our land base (2 million acres). The vision calls for as much as 6 to 7 million New England acres producing food – 15 percent of the region, which is about where we were in 1950. That would mean several hundred thousand acres in and around cities devoted to intensive production and several million acres of rural farmland abandoned since World War II supporting crops and livestock. Beal noted that the vision plans for New Englanders in 2060 eating more diverse and healthier foods than today. The vision modeled three diets. The expanded acreage in all three scenarios leaves 70 percent of the region forested. A companion document, Wildlands & Woodlands (http://harvardforest.fas.harvard.edu/news/wildlands-and-woodlands-vision-new-england-landscape), produced by staff and other researchers at the Harvard Forest, recommends that 70 percent of the region stay forested for ecological and economic reasons. In the mid-19th century, said Beal, large swaths of southern New England had as much as 50 percent of the land cleared for farming; in some places, as much as 75 percent. “From this, we learned … that there is certainly a line that can be crossed where too much land in production can cause numerous ecological issues.” After that period, we learned to grow more food on less land, as production remained relatively level. Calculating fisheries production is more difficult, said Beal, as fish move around and are hard to count. Historically New England fisheries markedly increased harvest volume in the 19th century, as we were ramping up agricultural production, to supply markets here and beyond. A motorized fishing fleet and new technologies improved catch efficiency and increased landings, but with long-term impacts on some species. In looking forward, the vision identifies many factors that impact the productivity of fisheries, including healthy watersheds; competing uses such as transportation, energy generation and aquaculture; and land use and conversion. “Moving from 3 million to 6 million acres for agriculture, if not done right, can impact our water quality,” said Beal. The vision seeks to protect and restore keystone species, particularly fish considered the forage base. Beal noted the exciting progress in the number of spawning alewives that have returned as large dams have been removed. In relation to fisheries, the vision also calls for research on climate change impacts and strategies for adaptation; and for policies that support regulatory structures and management strategies that are flexible and allow for shifting ecological and economic conditions. “We found that, over the most recent 10-year average,” said Beal, “if we ate every fish that we harvested from the Gulf of Maine and New England, we are producing only about 2.5 ounces of seafood per person per week in New England. That’s a long way from USDA’s recommended 9 or so ounces per person per week. This begs for discussion about how we promote sustainable consumption.” Beal also noted that a lot of that current catch is lobster; that the species richness and production now is just a fraction of what they once were. “It’s hard to predict exactly what will be here in the future or how much, but we need to do all we can to support restoration of our freshwater and marine environments if we want fish to be part of our diets,” said Beal. Four core principles or aspirations guide changes to the food system recommended by A New England Food Vision: Everyone has access to healthy food; everyone enjoys a healthy diet; food is sustainably produced; and food helps build thriving communities. Beal said she has heard arguments against localizing our food system. Some say, for example, that New England agriculture is just a drop in the bucket; that the kind of agriculture or the scale of agricultural production in New England does not measure up to that of other places with massive fields of monocrops and big, efficient machinery. Some argue that transporting large amounts of food around the globe creates energy efficiency. Beal believes that this kind of thinking is oversimplified and inappropriately reductionist; that it relies on many generalities and assumptions and does not account for the externalities created by our existing global food system. “We also can’t forget the failures or our greater food system,” she added, including food insecurity and hunger, diet-related illnesses, social injustice and environmental degradation. Regarding illnesses, “We’ve developed diets highly dependent on unhealthy, processed foods, because in some cases these are the most affordable, thanks to subsidies and inherent market distortions.” The result: high rates of preventable chronic diseases – the leading causes of death and disability in the United States. The CDC reports that about half of all American adults have one or more preventable chronic diseases, many related to poor eating patterns and physical inactivity. And the Center for Science in the Public Interest says that in the last 30 years, obesity rates have doubled in adults, tripled in children, and quadrupled in adolescents. The total annual costs of direct and indirect healthcare spending in the United States for just the top seven diet-related chronic diseases is $957,900 billion. Regarding social injustice, Beal noted the many farmers and farmworkers who don’t make a fair wage; the many minorities who are exploited through systemic racial inequity; and the human rights violations through poor working conditions and sometimes even forced labor. We unwittingly support these things when our food dollar travels far from here, said Beal. Environmental degradation includes water pollution due to overuse of fertilizers and pesticides, topsoil loss, greenhouse gas emissions and more. Currently New England has about 2 million acres in production, almost 40 percent of that in Maine. To scale up New England to 6 million, said Beal, would mean tripling the amount of land in production in New England but would likely mean almost a quadrupling land in production in Maine, because we have the land base. Retired University of Southern Maine professor Mark Lapping, a Vision co-author, stressed that we don’t want Maine to be the raw materials producer for value-added activities that happen elsewhere – we want to see that potential realized here. Nor do we want, said Beal, to overly fixate on exporting food to markets elsewhere for the sake of the highest dollar when people in our own communities can’t access adequate nutrition. Beal highlighted two big efforts that would help. We need to support strong incentives, including with our food dollars, that reinforce the type of production and practices that promote the four core values of the New England Food Vision; and we need to support organizations that do good work to build the kind of food system we want. 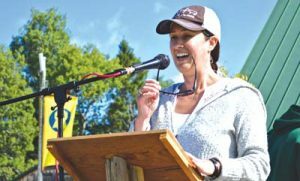 She cited MOFGA, Maine Farmland Trust, Cultivating Community, Penobscot East Resource Center, Downeast Salmon Federation, and many more as examples in Maine. For context, she noted that The Hershey Company alone reportedly spends $562 million per year promoting its chocolate and other products; that food companies spend $33 billion on advertising each year; and that the food industry spends $1.8 billion on advertising and promotions to children each year. The vision of getting to 50 percent local food by 2060 can help. The document is being used to further conversations in communities; to inform local and state policy development in a nonpartisan way; as a teaching tool in college classes and in research by graduate students; and by businesses and other organizations to reflect upon their role in advancing it and the resources needed.